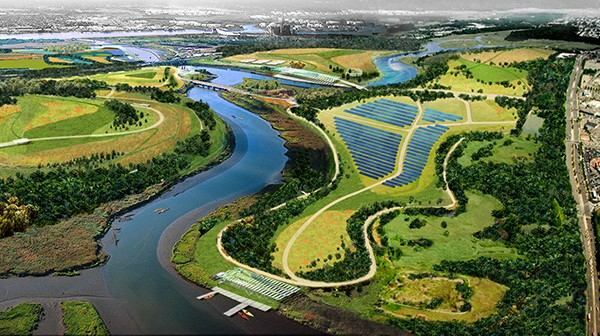 New York City Mayor Michael Bloomberg has announced that what used to be the world’s largest landfill in Freshkills Park, Staten Island, will be transformed into New York’s largest solar energy facility. The new solar plant will be able to produce five times more electricity than any other solar system in New York. At 10 megawatts, it will produce enough energy to power about 2,000 average homes. The solar power installation will cover 47 acres and will contain 35,000 solar panels. In a public-private partnership, the land for the solar plant will be leased to solar company SunEdison, which will build and operate the plant for the City. The development of the plant, which is part of the City’s long term PlaNYC plan, will increase the amount of solar energy produced by New York City by 50%. Part of the aim of the new development is to help nurture the local renewable energy market, as well as to reduce the City’s greenhouse gas emissions. Elsewhere around New York City, earlier this year two megawatts of solar energy were installed on four city-owned buildings, including the Port Richmond Waste Water Treatment Plant, two Bronx High Schools, and the Staten Island Ferry Maintenance Building. Altogether, nearly 700 kilowatts of solar power are already installed on city-owned buildings, with plans more much more into the future. That’s awesome. Green is the way to go!